Comfort and education are important when choosing your dental practice. Since 1997, Albany Dental Care has made it our mission to provide patients with comprehensive cosmetic dental services that enhance patient comfort while yielding the most functional and aesthetic results. From deep cleanings to dental implants, we are prepared to aid you in your journey towards a beautiful smile. From your first visit, Dr. McCrady and our team strive to educate patients on their individual oral health needs and how to best achieve a healthier, more beautiful smile. It is our belief that by helping you to understand the benefits of your various treatment options, you can make the choice of cosmetic restoration that best suits your personal needs and satisfaction. With modern tools like our Omnicam® digital imaging camera and our in-office CEREC® machine, we provide patients with new insight into the health of their smiles, allowing them to better understand their dental needs. By coupling these innovative technologies with educational videos, we help patients take charge of their smile and choose the procedures that work best for their needs. While much of our practice’ efforts to maximize patient comfort focus primarily on using education to eliminate unknowns, some individuals remain anxious to receive dental treatment. Oral and inhalation conscious sedation options like nitrous oxide and valium are safe, ADA-approved ways for our Albany dentist to ensure that even highly fearful patients can enjoy the tranquility of our office and comfortable, successful treatments. 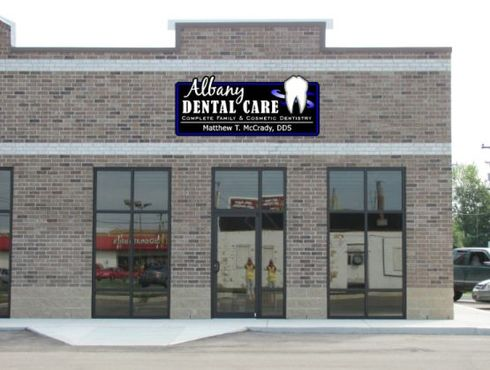 Our Albany dentist serves patients with the cutting edge in equipment, procedures, and a hygienic environment. Whether you are in need of a single tooth dental implant, or a crown made in-office, Dr. McCrady keeps up to date on all of the treatment options and technologies available in modern dentistry. In an effort to enhance patients’ ever-changing experience, our office also adheres to the strictest standards set by the American Dental Association, the Occupational Safety and Health Administration, and the Center for Disease Control. If you are looking for high quality cosmetic restorations, call or schedule an appointment with Dr. McCrady and our team at Albany Dental Care. We are committed to serving patients of Albany and the surrounding areas.